Originally completed in 1995, Oracle III was developed in the twilight years of the C64's commercial existence, and as such it suffered the same fate of many games of that period in that it failed to find a publisher. However, miraculously the game that everyone thought was lost recently reappeared on CSDB in 2006, and a few more years down the line Art Project Studios finally managed to get their game out on (digital) shop shelves via retro publisher Psytronik! This one completely slipped under my radar when it was released at the end of 2011, and despite not being a huge puzzle game fan I thought I'd take a gamble on the £1.99 download to show my support. 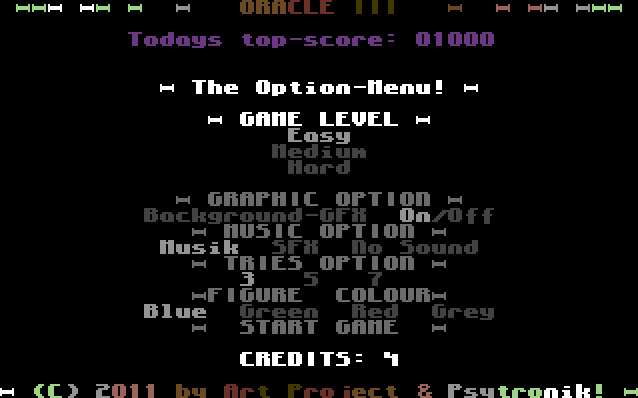 And as it happens, this turned out to be a gamble worth taking - Oracle III is a fantastic and original game with high quality production values and a huge amount of levels to beat. 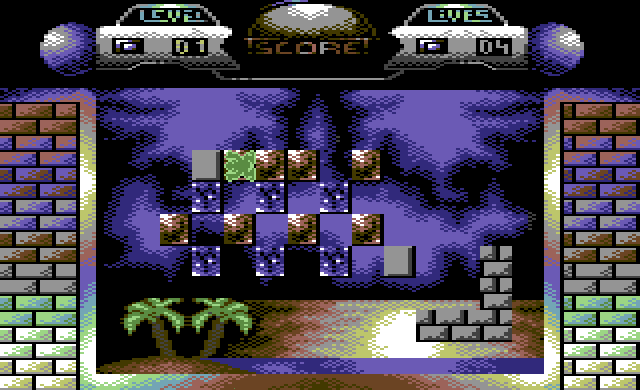 At it's core, Oracle III is a tile matching game - a genre that I usually loath - but the twist here is that instead of controlling a generic cursor you move about a little frog (or Free-Roaming Object Grappler, to be precise) who has to ride the tiles around the screen in order to join them together. So from you starting point, every time you move on from two or more connected tiles of the same pattern they vanish - and when you need to move tiles from one area to another you have to repeatedly swap them around each other by jumping between them every time you move. This gives the over-saturated match-x genre a refreshing arcade feel, whilst still requiring a good deal of cerebral prowess in order to progress through the more difficult levels. But I'm jumping forward here - lets talk a little about first impressions. 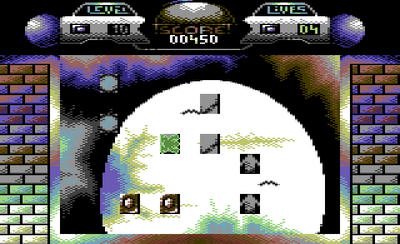 Upon loading the game you are initially presented with a cracktro-style intro screen (complete with logo, a bouncing sprite and fading credits text), clearing show the game's scene roots. Its obvious that a lot of work went into the presentation, and it makes a refreshing change to many other modern homebrew games that throw you straight into the action without building up any atmosphere beforehand. 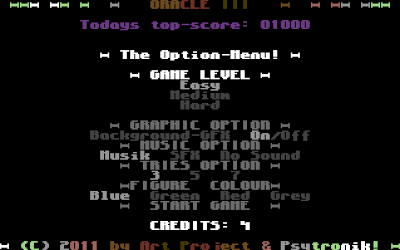 Oracle III wants you to know that it's a special game from the outset, and this intro is certainly a great start. Following this, the player is faced with a rather ominous looking full-screen of text options, but ultimately it's pretty simple - select difficulty, turn on or off background graphics and music/sfx, set your lives and frog colour. Each difficulty setting has 32 screens to solve (with a fourth difficulty unlocked after mastering the hard setting), meaning that there are 128 to beat in total. Not only that, but you have just a few lives and five credits in which to achieve this - and with no passwords Oracle III is far from a casual affair, requiring time, practice and dedication to beat. 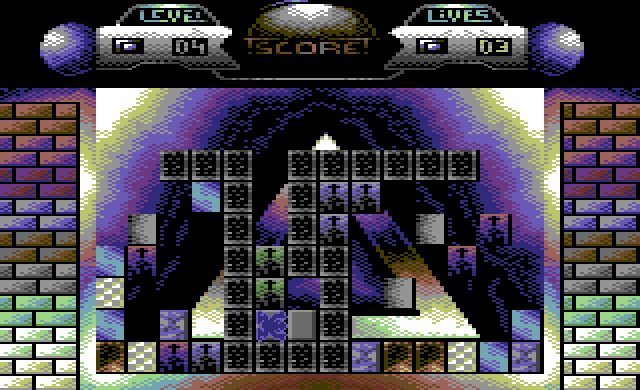 The game features an incredible amount of content, with a wide variety of background graphics (although on some levels the game can be less confusing if you turn them off) and an excellent ambient SID soundtrack that is more than worthy of the bonus OST-CD release that is packaged with the premium disk version of the game. However, I can't end this review without picking at a couple of small things that niggled me whilst playing. 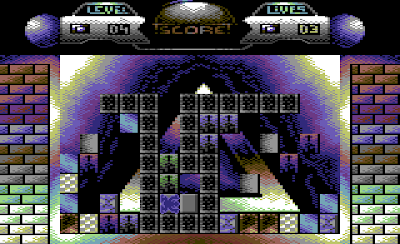 I suspect that like me, the majority of C64 gamers these days don't have the time it would take to beat all 128 levels in one sitting. As I played the downloadable version through VICE, this wasn't a major issue as I could save my game via a memory snapshot - but I can't help but feel that a password system would have been a great addition to the game. Having said that, at least it isn't necessary to actually beat all the intelligence-insulting Easy and not-much-harder Medium levels to win - I'm told that the game can actually be completed by beating the 32 Hard and unlockable 32 Professional levels only, although I haven't been able to achieve this myself yet. 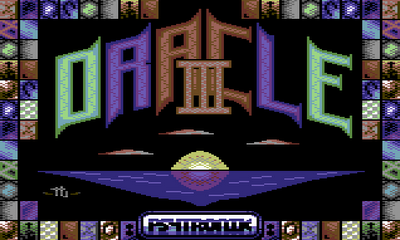 I say 'yet' here because Oracle III is definitely a game I'll be returning to again. What I've played so far I've thoroughly enjoyed, and considering I'm not usually a fan of the genre (read as 'a match-x hater'), this is quite an achievement. Sadly there's no demo version available, but if this review has at all piqued your interest then I'd certainly recommend that you give the super-cheap £1.99 digital download a go - although to be honest, after hearing the soundtrack I'm almost regretful that I didn't buy the £10.99 premium version to get the included OST CD. I've played it for a couple of hours and it's amazing. Easy to complete each level but loooonng to finish it !!!! !